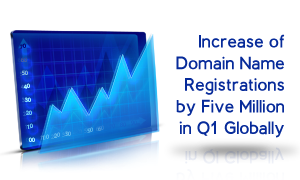 The first quarter of 2014 was marked by an addition of five million domain name registrations globally, mirroring the results of the fourth quarter of 2013, according to the latest Domain Name Industry Brief by Verisign. The total number of domains has reached 276 million as of 31 March. The five-million domain name increase in the first quarter of 2014 globally stands for a growth rate of 1.7% for the quarter, compared to 1.9 % in the fourth quarter of 2013. Registrations globally have increased by 19.3 million (18.5 million in the calendar year of 2013), or 7.5 % (7.3%), year over year. The top-level domains .COM and .NET experienced aggregate growth with a combined total of around 128.5 million domain names in the adjusted zone in the first quarter of 2014. This signifies an increase of 4% year over year. Comparatively, the year 2013 ended with 127.2 million domain names and an increase of 5%. As of 31 March, 2014, the total number of .COM domain names under management equalled 113.2 million (112m at the end of the fourth quarter of 2013), while the number of .NET domain names equalled 15.2 million (the same as for the end of the fourth quarter of 2013). During the first quarter of 2014, new registrations within .COM and .NET totalled 8.6 million. In the first quarter of 2013, new .COM and .NET registrations amounted to 8.8 million. These figures topped the ones in the fourth quarter of 2013 (8.2 million new registrations) and the fourth quarter of 2012 (8.0 million new registrations). These numbers could reflect seasonal differences but it could also demonstrate that new gTLDs aren’t impeding new .COM registrations. Among country code top-level domains (ccTLDs), there were added 27.1 million domain names, a 2.9% increase quarter over quarter, and a 13.1% increase year over year. Amongst the top TLDs in general, the .RU domain (Russia) moved up to the eighth position, swapping places with .INFO (the seventh). Four out of the 20 largest ccTLDs exceeded 4% overall quarter-over-quarter growth: Tokelau (8.0%), Argentina (7.2%), India (15.2%) and Colombia (12.4%). As of 31 March, there were 283 global ccTLD suffixes approved by ICANN, including IDNs (Internationalised Domain Names), with the top ten ccTLDs comprising 65.8% of all registrations within ccTLDs. If you wish to register a domain name that will suit your needs, be it .COM, .NET, a new gTLD or a ccTLD, please click the domain extension to check the name availability. If you have any questions or need assistance, please don’t hesitate to contact us by email at support@web-solutions.eu or via phone on +44 (0) 208 133 3994.